In February this year, Tom Brady lost much more than a Super Bowl to the New York Giants. In February this year, Brady lost his long-time mentor, and friend, Tom Martinez. Martinez died in February after suffering a heart attack during dialysis after being diagnosed with diabetes and cancer. Martinez had worked with Brady for over 20 years and would spend each off-season refining his mechanics. During minicamp this week, Brady has had to work without Martinez and use another method to constantly remind him of where he needs to improve. Each year Brady wears a wristband during practices. Normally that wristband is full of offensive plays for him to refer to. This year that band is full of phrases reminding him of certain aspects of his mechanics that need refining. If you were to watch Brady on the field, you would not notice any significant issue with his throwing motion. In fact, his overall mechanics are among the best in the league. Mechanics aren't really a talent. They are a skill that can be learned through repetition and focus. Brady certainly has that focus and determination to consistently work on his technique in the pocket. Undoubtedly he also has as much talent, if not more, than any other quarterback in the NFL, but there are two aspects of Brady's game that really can't improve from practice or through talent. Bill Belichick is a great head coach. There is often a lot of debate about whether Brady or Belichick is the more important person for the Patriots' success. It is unquestionably Belichick. Despite receiving most of his plaudits for his excellent work with the Patriots defense over the years, Belichick has put in place a perfect offense to get the best out of his former sixth round draft pick. For years, Brady supporters in the great debate about who is the best quarterback in the NFL point to the fact that Peyton Manning has always had great weapons, while Tom Brady only did sporadically throughout his career. What is completely overlooked by the general public, is that Brady has always had greater weapons on the offensive line than Manning, or any other quarterback for that matter. Offensive linemen aren't considered weapons by the common football fan, but they are just as crucial, more than some, than any other position on the field. If Peyton Manning had had better protection in Indianapolis, he may never have missed last season because of multiple neck surgeries. If Michael Vick wasn't running for his life last year on every snap he could have led the Eagles to the playoffs. If Eli Manning wasn't playing football out of this world last year, his offensive line likely would have kept the Giants out of the playoffs. You can overcome an average offensive line with great weapons, but you can also make average weapons look exceptional with better pass protection. Brady, like Philip Rivers proved to be last year, is a quarterback who can get the best out of skill position players, but can't overcome constant pressure or endure repeated punishment. He is not built like Ben Roethlisberger or as fleet footed as Michael Vick. His intelligence does allow him to have fantastic pocket presence but that also is something that can only do so much. With outside pressure, Brady is intelligent enough to evade pass rushers by stepping up into the pocket or by using a quick sidestep. However, he is not so capable when there is no pocket to step up into. Without his feet under him, Brady is often forced into mistakes. When his mechanics are perfectly set, as they are when he is not under pressure, he throws almost perfect passes. When there is no perfectly clean pocket to throw from, Brady's performance takes a serious hit. Obviously this is something that affects all quarterbacks, and pointing it out with Brady is nitpicking considering how effective he is on the field, but if Brady does indeed want to improve, then that is a major flaw of his. Fortunately for him, Bill Belichick's investment in tackles, guards and centers has always been prudent. Last year's line consisted of five players with six previous all-pro honors and a first round rookie pick entering the season. Logan Mankins and Brian Waters were arguably the best two guards in the NFL last year, despite a dip in form later in the season. Matt Light was a proven veteran at left tackle, while his heir apparent, Nate Solder, was filling in at right tackle for Sebastien Vollmer. Dan Connolly quickly replaced the injured Dan Koppen and had a phenomenal season playing out of position at center. This year Brady will likely face more pressure through the middle as his best lineman's status is unclear. 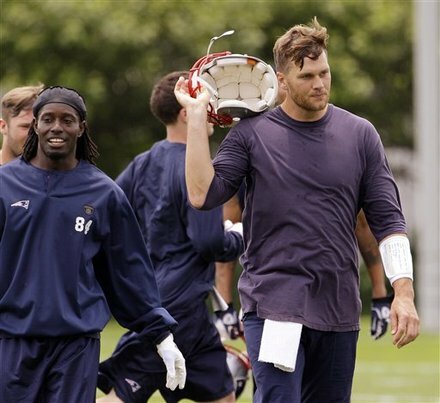 Even if Logan Mankins misses the whole season, Belichick added Robert Gallery this off-season to fill the void. Gallery may have failed as a left tackle initially for the Raiders, but he is a more than capable guard. While Brady desperately needs his pass protection, he also needs his matchup breakers on the outside. Lets get this straight first of all. This flaw in Brady's game is not a glaring one. It is not something that significantly affects his level of play, but when you reach the heights that he has throughout his career, you expose yourself to greater scrutiny. Brady, along with the Mannings, Drew Brees and Aaron Rodgers, are all held to a different standard than your average Andy Dalton. Brady won his three Super Bowl rings playing on defensive led teams, but he has proven that he can be a dominant player during some of the seasons outside of those years. In 2007, with Randy Moss, Brady broke the touchdown record for the regular season that had previously been set by Peyton Manning. That year the Patriots offense was so good, it was simply for Brady to just pick apart defenses because of the mismatches Moss, Wes Welker and Donte Stallworth created on the outside. Brady knew more often than not before the snap where he wanted to go with the football. Similarly last year, with Rob Gronkowski and Aaron Hernandez on the field together, Brady was able to dictate what opposing defenses were going to do and predetermine where the football was going to go an awful lot. Gronkowski and Hernandez are scheme busters who destroy conventional gameplans because they cannot be covered by linebackers in coverage, but will overrun secondary players in coverage. That is the genius of Bill Belichick's mismatch offense(that explanation is for another article however). What Belichick's mismatch offense forces the defense to do is show their hand. Rarely did teams even attempt to blitz the Patriots last year because it was too difficult not to camouflage the play call. That meant that Brady didn't often have to adjust after the snap. Obviously he still had to read coverage, but rarely was he rattled or completely surprised by what the defense threw at him. Only a handful of teams managed actually get inside Brady's head last year. The Buffalo Bills, Pittsburgh Steelers and New York Giants were able to remove the Patriots' mismatch offense advantage because of specific skill-set players that they had. With dynamic players like Cortez Allen, a Steelers cornerback who basically shut down Gronkowski on his own, Marcel Dareus, who was able to rush the passer while also consuming double teams in the Bills' nickel package, and the Giants' whole defensive line, each of those teams was able to take away Brady's matchup advantage prior to the snap. For any quarterback, it is difficult to adjust to post snap changes, but because Brady doesn't face defenses trying to confuse him often, when they do he rarely reacts well. It is no surprise that the Buffalo Bills drafted Stephon Gilmore this off-season and the New York Jets are looking to use more of the 46 defense. Those two moves are direct responses to Brady's dominance within the division last year. Picking faults with Tom Brady's game is like complaining about paying taxes on winning the lottery. No matter what you've still got a great quarterback on your roster, but considering Brady's passion and drive is to be as close to perfect as possible, it doesn't hurt to help him explore the aspects of his game that need improving. There isn't really much preparation or ability required in fixing these issues. They are instinct plays that a player often just needs to be wary of to simply react better to them when they occur. At 34 years of age(35 when the season starts), Brady is still approaching his career as if he were a rookie. That in itself is a blessing for Boston as much as his talents have been over the years. If he keeps working on his game, he very well could play past 40 like he aspires to.